Tacoma Mayor Marilyn Strickland and Windsor, Canada Mayor Drew Dilkens : Tell Sister City, Gunsan, South Korea, That We’re Opposed to Torture and Consumption of Dogs and Cats! Gunsan, South Korea became a Sister City with Tacoma in 1979 and Windsor, Canada in 2005. In Gunsan, there are countless dog farms, slaughterhouses, markets and restaurants where the dogs, who are tortured their entire lives, end up being slaughtered in the most inhumane ways, such as by electrocution, hanging or beating; and then thrown into boiling water – sometimes while they are still alive. In many places, dogs are being killed in full view of other terrified, caged dogs; and this takes place in broad daylight. In addition, many abandoned and stolen former pets end up in this industry, and are subjected to the same cruelty. Have you ever wondered what Hell is like? Click HERE to watch undercover videos from a dog slaughterhouse in Gunsan. There are no words to describe the daily horror of this “Hell On Earth.” And there are so many dog slaughterhouses, farms and meat markets like these all around Gunsan. A Search Engine reveals the sickening scale of Gunsan’s dog meat demand. The searches resulted in: 242 Health Food Shops; and 36 dog meat restaurants in and around Gunsan. Even if half of these ‘Health’ Food Shops and restaurants serve dog and cat ‘ingredients’ in one form or another, just imagine how many dog/cat slaughterhouses must be present in and around Gunsan in order to supply all of these outlets. 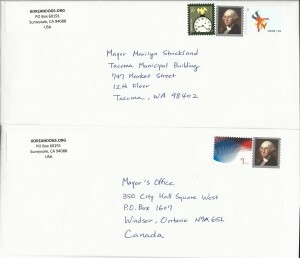 Please sign petition, call, write and email the Tacoma and Windsor Mayor TODAY! Do you think that Windsor should be a Sister City to any city that allows dogs and cats to be tortured and eaten? Please urge Gunsan Mayor Kang Im-June to close down all illegal dog farms and slaughterhouses, markets, truckers and restaurants who serve their products. An online petition calling for your support in ending the horrendous South Korean dog and cat meat cruelty is in progress: https://www.change.org/p/victoria-woodards-mayors-of-tacoma-and-windsor-tell-sister-city-gunsan-south-korea-that-we-re-opposed-to-torture-and-consumption-of-dogs-and-cats. No matter where you live PLEASE SHARE these actions with your friends – especially those who live in Tacoma and Windsor, Canada! Update June 19, 2015: We mailed our petition letters to the Mayor Strickland and Dilkens. Can we count on your voice, too? Please do something to stop these atrocities to living creatures! This is not what God intended for us to do to animals. Cela suffit !!!! Plus de massacres d’un autre temps!! Nous sommes en 2015, nous plusieurs milliards d’humains sur cette planète. Les animaux étaient là avant nous, cessons de les considérer comme des êtres insensibles à la douleur. Shocking, cruel, I have no words for these atrocities! I was horrified to see what torture they are inflicting on these innocent and loving souls. I am in anguish and pain, heartbroken by this. This is hell on earth. To inflict pain and suffering on another living being is wrong. We should boycott until they stop this horror. I hate these people for what they are doing here. I desire that you and your people will sufer much more for the eternity tha those dear dogs sufered inthose days! I hate your horrible kind! Stop this inhuman slauther of this poor creatures. Why this brutality? It has been shown that like humans cats and dogs have the capacity for courage , loyalty,love, compassion,joy in socializing and play. People are missing out big time when they abuse or disrespect these animals. My heart hurts I cry can’t watch.The President of Korea, no heart, no children, let God punish you. I am just so shocked that people can continue with this cruelty to animals! Do they get some satisfaction seeing these poor animals suffer!!!! SHAME ON YOU! To all you cruel people I say you will be punished one day for this cruelty. When the earthquakes come and the tsunamis come maybe then you will learn that what you are doing is unacceptable to us and to GOD!!!!!! WE CAN’T STOP FIGHTING AGAINST IT!